As the oppressive heat of summer truly begins to set in, starting up the oven, the stove and even the barbecue can seem to be too much. For these reasons I absolutely love to have some light salad recipes on standby. To me, nothing quite characterizes late spring and early summer as well as this light and extremely easy salad, prepared from all manner of seasonal fruits and veggies. 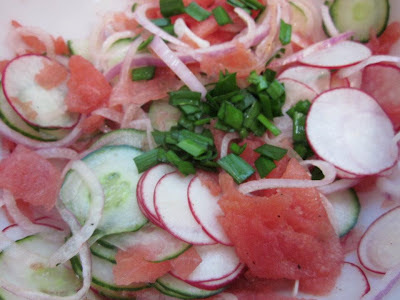 1)Wash and prep vegetables slicing the radishes, onion and cucumber into thin rounds with a mandolin and mixing them together into a salad bowl. 2)Chop the watermelon thinly and lay it on top of the mixed vegetables. 3)Coarsely chop some fresh garlic chives, chives or green onion stems (I just used what I had in the garden) and add to the salad. 4)Combine the lemon juice and the olive oil, mixing vigorously or shaking it in a jar, pour over the salad before adding some freshly grated black pepper. 5)Mix vigorously, serve and enjoy!